The Pace/CTA Coordination Plan aims to better understand existing travel demands, create a strong grid network, improve service for more riders, and establish new connections and transit markets. There was opportunity for community input regarding route changes in September 2017. Changes to bus routes will be released in phases. Phase 1 is scheduled for August 2018. Phase 1 includes service changes to Pace Routes 208 and 213 and CTA Route 205. There are no planned changes to CTA Routes 93 and 97. There are plans to increase and better coordinate service on CTA Routes 201 and 206. Community members will have the opportunity to comment on Phase 1 service changes. The tentative date for the public hearing is April 24, 2018, 4:30-6:30 pm at the Levy Center. The proposal’s most significant change is the elimination of the CTA Route 205 bus. The 205 travels through Evanston from Howard Station to the Skokie Courthouse, running along Chicago Avenue, Church Street, and Golf Road. The 205 is the primary route that students living in southeast Evanston use to get to and from the high school. Students use the bus from early morning to early evening. In the proposal, CTA 205 bus ridership would shift to Pace. The Pace 208 bus, that currently runs between Schaumburg and downtown Evanston along Church Street, would be modified to operate on Golf/Emerson and on Church between Dodge and the Davis CTA Station. To compensate for the loss of bus service on Chicago Avenue south of Church to Howard, Pace would extend Pace 213 service that now runs from Northbrook Court to the Davis Street CTA station. A Pace representative, Steve Andrews, said that at peak hours (before and after school) the Pace 213 bus would continue west from the Davis Street CTA station to the high school, providing a direct route. At other hours, riders from the south would have to transfer to the 208 bus at Davis to continue west to the high school. Andrews said the exact schedule for the service hasn't been determined. 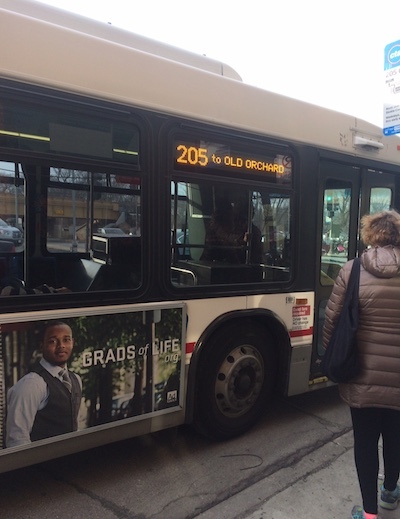 At the March 28 Evanston Transportation and Parking Committee meeting, members expressed concerns over the lack of all-day direct service to ETHS under the proposed bus route changes. They urged representatives from CTA and Pace to not reduce direct service to the high school in bus route changes planned for later this year. GoEvanston will also advocate for direct and increased bus service to and from ETHS. It is not good public transit policy to ask students, at any time of the day, to transfer buses to get to their high school in a town the size of Evanston. We would also like to see Saturday service to the high school for Wildkit Academy, sports practices/games, and other events. If we are to encourage more families to forgo driving to and from the high school, we need to ensure that there are more, not fewer, options for getting there on public transit. We encourage citizens to attend the public hearing on the proposed changes tentatively scheduled for 4:30 to 6:30 p.m. on April 24 at the Levy Center. The Pace/CTA Northshore Coordination Plan can be found here.